Accucraft packaging is a joy to behold and the unwrapping takes care and patience! And then there she is! While carrying out a steam test, I discovered that the safety was blowing off a bit high, so I needed to work out how to adjust it. It is a scale representation of the Salter valves, so unlike any of the normal Accucraft ones. Well it turns out that the centre 'pillar' is the safety adjustment. It is just necessary to loosen the nut on the top of the arm and turn the safety valve body to adjust. Needless to say, not much adjustment was needed and I would not recommend doing this unless you know what you are doing! When mine was adjusted (less than a turn anti-clockwise) I tightened the nut and the job was done. This is not simple, so you need to think very carefully! The body is held on with six 2mm hex head bolts, so a nut spinner is essential. There should be one provided with the loco. Two bolts hold the flange at the back of the cab. 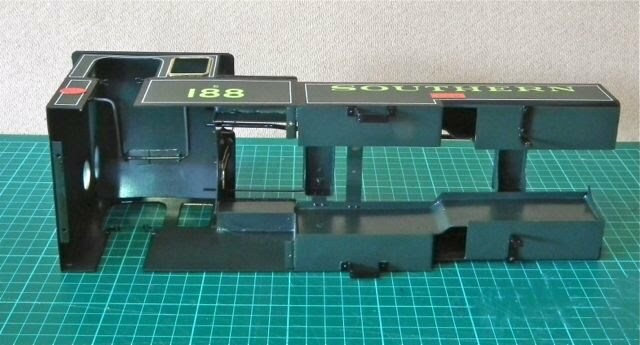 If the loco is already fitted with radio control, you may need to move stuff to get at these. The are two brackets, one either side, behind the valve gear. It is possible to get a spinner on the bolt into the chassis frame by moving the wheels until the valve rod is in the best position. The final two bolts are easy - one either side under the tank. So having removed all of the above - would the body come off? No! It is necessary to remove the safety valve arm as this projects through the cab front. Remember that the centre is the adjustment (see above) so try not to disturb this. Next you have to deal with the blower pipe. 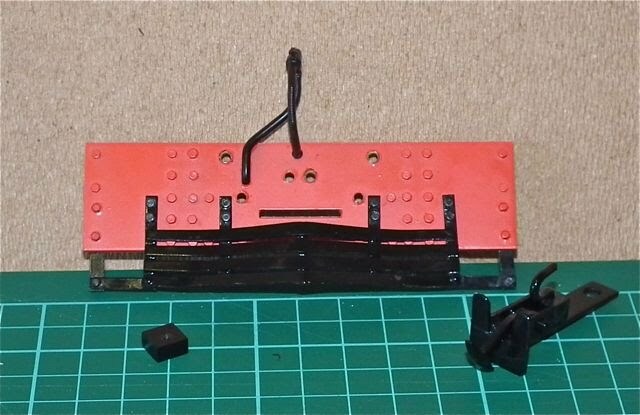 Already you will be able to ease the body up, but it is held by the blower pipe which has a threaded rod just pushed through a hole into the smokebox. I thanked heaven there was no nut on it as with the insulation in the smokebox, this would have been a total pain! It was, however, too long and at such an angle that it would not lift clear. In the end, I eased it out as far as I could and cut it with side-cutters leaving a 3-4mm stub. This seems drastic but is fine. Now you find that the gap between the tanks is narrower than the widest point of the boiler. The tanks have to be gently sprung apart to be eased over it. There may be paint loss - but this will be hidden when the body is replaced. I was lucky! Looking at the underside of the body, you can just see the holes for the bolts at the back of the cab, at the back of the tanks and atso the brackets at the front of the tanks. And here is the loco with the body removed. The dummy firebox is loose and just lifts off so take care not to drop it. One of the pillars on the safety valve dropped out as it is held in place by the top lever. Please note that in the photo above, the smokebox and apron has been sprayed matt black. Yes - this is mostly the reverse of the removal, but it is an awkward job. The tanks have to be eased out and srung round the boiler and then, as it settles into position, you need to locate the blower pipe in its hole. There were no ill effects from shortening the stub. I couldn't get the body to seat properly at first, until I realised that the dummy firebox has to be as far forward as it will go and the cab front seats behind it. Watch out for the cab handrails which have to go through the bracket holes when the body settles the last few millimeters! Replace the bolts carefully, using the nut spinner to grip them as they are inserted. 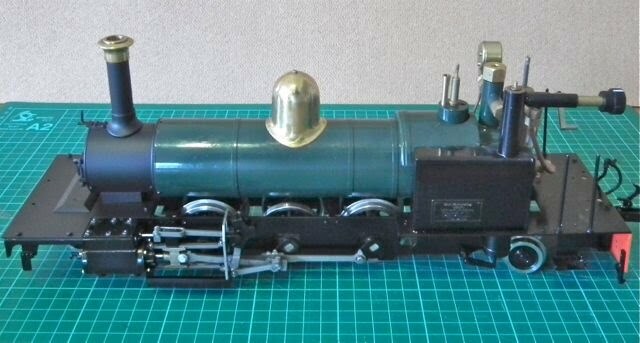 In general, I find the finish on this loco way too shiny, and this is particularly the case on the smokebox. It just had to be painted and this was the reason that I removed the body. The problem was that I couldn't remove the smokebox! 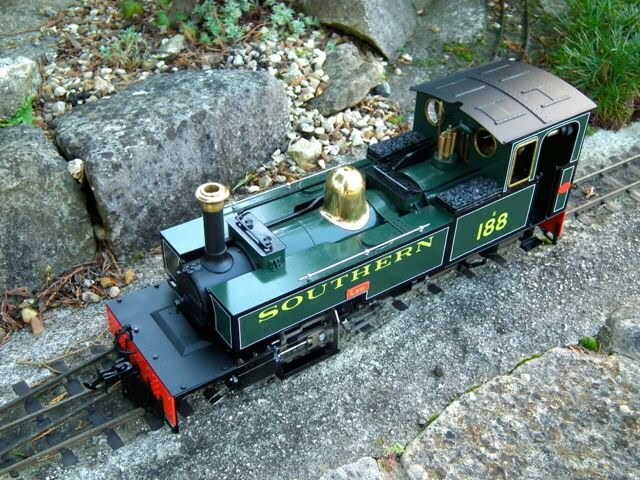 There are two inaccessible 2mm bolts underneath, but I was stumped by the three tiny 1.5mm hex bolts which appear to hold the smokebox to the boiler. My 1.5mm spinner had escaped me, but I think it would be too wide to undo these. As a result, I decided to spray the smokebox and front apron together. Fot this, I neeeded to remove the front buffer beam (see below). After degreasing with a spray and working the detergent well in with a brush, I rinsed off using my Jackson's Superior pump bottle. It was excellent for the job. Then it was dried in front of a fan heater and gently rubbed with an abrasive fleece to key the surface. A wipe down with thinners and it was ready to be masked. I took a lot of care with this as I didn't want any over-spray. It is amazing how paint can get through tiny gaps! I sprayed using Rustoleum Matt Black Stove Paint, because I like the finish. Two good coats, flashed off with the fan heater between coats and after. As I didn't want to bake the loco, I then gave it 24 hours to dry. And now with the masking removed and the chimney cap replaced. I removed the smokebox dart to paint separately. So the answer is take it all apart really carefully!! Replacing is the reverse process but remember that the longer bolts are for the centre two holes to secure the coupling mount. Re-fitting the coupling (in my case with a new spring) is a bit fiddly as the bolt goes through the coupling, then through the spring and the into the threaded hole in the block as far as it will go. The cab roof was also too shiny for me, but luckily this was really simple to rectify. It simple unclips and then can be degreased, lightly abraded and sprayed with Halfords matt black acrylic. As usual I flashed the coats off with the fan heater and then gave it 20mins at 100 degrees C in the oven. As I write this, I have not made a decision about the tank tops. 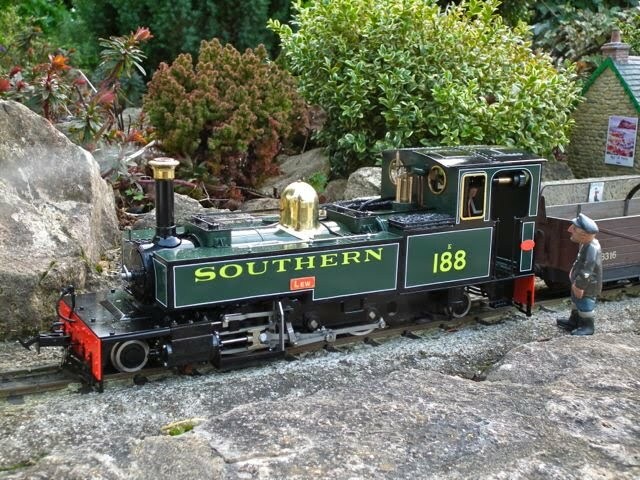 They should be black, according to the L&B experts and indeed my previous model of Lew (the coal fired Ace) had them correct. However, the body is seriously complicated and the only easy way would be to brush paint them. The trouble is that I am not confident that this would look good enough. Another option would be to unbolt the sandboxes and remove them, together with the blower pipe. It would then be possible to mask and spray, though the hand rail knows are still a problem as they are soldered in. Well I tried to remove them by turning down the end of my 1.5mm nut spinner to fit in the small gaps. Not a chance! The bolts just would not move so I abandoned the whole idea - especially as the loco has to run this weekend at a show. Maybe I will just get used to them being green! I have to admit that I am pleased with the matt smokebox and cab roof - it is worth the effort!